Hello from a sunny, warm Wellington, where the sky is blue and we are being deafened by cicadas. It is time for Six on Saturday – so thanks once again to The Propagator for allowing us to share what is going on in our gardens. First up, the weather. We had a few millimetres of rain last night, but otherwise is has been dry and warm (not always sunny…quite a bit of cloud around too). It actually got to 32C in parts of Wellington this week. As a result, the ground is really dry, and my plants’ best friend this week has been my trusty watering can. Charlie our cat is not too keen on the hot weather as you can imagine, being a little black cat (see featured image above). Second up we have had a lot of tidying up to do today. There has been quite a bit of the cutting back of branches, in one case, a fern branch that was hanging over the steps to the house just a bit too much. I also need to weed the ‘dingy patch’, which is what I call the area which is behind where I am standing to take this photo. It is always in shade and the soil is poor, needing to be nourished before anything much (apart from weeds) will grow. As it is an area we never use for sitting in, it is also much neglected. I keep thinking it would be a good place for a compost heap. Third on the list is this broad leaf or Italian parsley that I brought home from supermarket and am hoping will grow a little in a nice big new pot. It is looking distinctly droopy though as I type, but as long as I have enough for a tabbouleh I am going to make tomorrow, I won’t cry too much. I would ideally like to have two parsley plants, so fingers crossed. At number four, the newer of the two curry plants is flowering. The older one is still in recovery, but doing reasonably well with some new growth showing. While pottering about outside, I noticed how this nasturtium has wrapped itself around the grass in one of the big pots. Not sure you can see it in the picture, but it means I can’t really move that pot now! Finally, I think I post pictures of the sky almost every week. Anyway, our remaining cabbage trees are at least flowering. The ferns of course just keep on growing. I guess you live in the least unfavorable area right now, compared to Australia, which has all the high temperature records we hear about … good luck! Not nearly as hot here as in Australia! Still worrying that the sea around New Zealand is hotter than usual. Blue sky, cicadas and 32C against half melted snow, threatening clouds and 2C. Not much of a contest, you win. I don’t much envy your watering, but a bit of warmth might be nice! I find the watering almost therapeutic after a day at work! Never tried growing curry plant but love the scent. Maybe time to give it a go. Oh for a bit of warmth! It is a great smell – if you like curry of course! It’s quite warm and dry for Wellington! 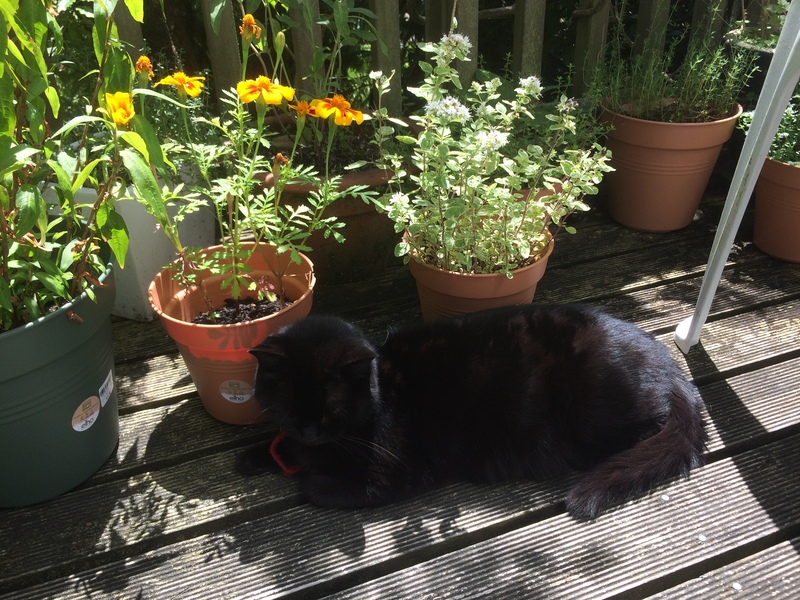 I love your little black cat resting by the colourful pots. Well, in the six years we have been here I think 5 out of 6 have been dry. But I wonder what will happen with autumn and winter given the warming of the seas around New Zealand….lots of rain? Nasturtiums are suppose to be edible in salads aren’t they? I’ve never tried them. Finally we had some rain today, hope you got some there too. All looking lovely and I can almost feel that warmth coming off that header photo. I bought a curry plant last year, but it hasn’t grown much. Hoping it makes a comeback. As Jim pointed out, we in the northern hemisphere would be very happy in yours right now! One of the curry plants isn’t doing well and one is. I’ve tried putting them both in different places, but one is happy and one isn’t. You are very welcome to come to Aotearoa! cicadas are the bain of my life in the summer. i like sitting and listening to them when I sit outside, but I just wish they had an off button for when we are trying to sleep 🙂 I keep seeing all these nasturtiums. I’m told you can put them in salad. Do you eat yours? There are some areas in the Botanic Gardens where the cicadas can be so loud it is almost deafening. I have eaten nastutiums – lovely and peppery.